Last Friday Shaken, Not Stirred had our first fundraising event for the Epilepsy Therapy Project at sweetFrog Frozen Yogurt. The owner’s, Steve and Sandy Anto graciously welcomed our crew and even brought in entertainment and games for the kids. 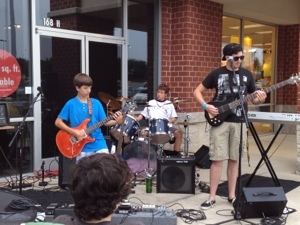 Their son, my son, and another young man who works at sweetFrog play in a band together. I dreamed up the idea several months ago to have a fundraiser and have the band play. The Antos were all in from the start and with a debut date on the calendar, it was all business for the band. I’m from the non-profit world and I did a LOT of event planning, way back when, but I’m a bit rusty these days. Thankfully, this time I had a full team of people to call on and the work was spread out with hands grasping for more. This is a special group of people and they not only see a task, they just take it and roll. We used every resource of labor we had available, including child labor. 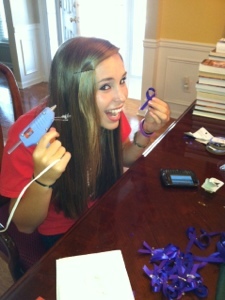 Sharon’s daughter, Addyson, spent one entire day making purple Epilepsy Awareness Ribbons. I apologize now for every hot glue gun burn and pin stick she has, but you should know we gave away every ribbon she made! We got donations from Taco Mac at Birkdale, Hickory Tavern at Birkdale, Chili’s in Huntersville, Longhorn in Huntersville and Carolina CAT and my kids assembled 150+ kids’ goodie bags to give away. Each business was overwhelmingly generous and not a single one turned me away! I didn’t know what to expect on the day of our event. I had advertised, our team had advertised and sweetFrog had advertised, but you just never know. It’s not so much about the money, OK, well yes, it is about the money that we are raising for the Epilepsy Therapy Project, but I want people to have the chance to learn about something that is so misunderstood. For years I flew under the radar because I was afraid of being misunderstood. I was embarrassed by how I had changed and my inability to cope in certain situations. Is that going to keep me from living my life to my fullest? It shouldn’t. I’m learning that. I’m learning to embrace change. 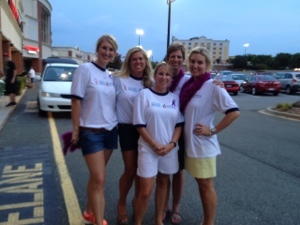 That’s what this race in Philadelphia with ETP is about; stepping out and being a face of epilepsy and brain injury. I hoped we would have the chance to share with people. The people, oh the people, the flood of people, and the endless flood of tears and emotion that I felt all night. It’s been a week now and I still can’t wrap my mind around it. The show of support spoke volumes. Every set of eyes came to see and to learn about what we were doing. These eager faces wanted to understand. Faces from my childhood, from my husband’s days in elementary school, faces from my high school, from college, from our wedding, my mother’s former colleagues, families from our small group, our devoted RUN-agades, my TEAM in Training Coaches (including my Coach who saw me fall in LOVE with running in Nashville back in 2008), my neighbors, from our church, my Mom (also our Shaken, Not Stirred head cheerleader), my Mother-in-law and Father-in-law and people I had never met that read about us and came out to support our efforts. In a very busy big world, on a Friday night in August, all these people converged on sweetFrog Frozen Yogurt. For six straight hours, there was laughter, friendship and celebration among the hundreds of people who made time to stop by. Having grown up in a small town, I often feel the strain of the quick growth of our area. Friday night showed me, it’s a small world after all. Friday night I met a woman and her family who came out because they read about our event online. She introduced me to her 11 yr old son. He was diagnosed with epilepsy when he was 3 years old and she was 8 months pregnant. For the last 5 years she has been working (I would say slaving is a better word) to secure a seizure dog for her son, and just last week they brought their new dog Chip home with them! I cried tears of joy with this mom as we watched her son play with Chip and I knew the immediate sense of relief she felt. This was an event worthy of celebrating! I tried my best to share my gratitude and most importantly the reason Shaken, Not Stirred came together. My thoughts were so raw and discombobulated I couldn’t even get people’s names right. As I looked on the crowd and no words could come from my mouth and only tears could flow from my eyes, my very small world was a loving world, an understanding world, an accepting world and the silence was ok. The night was a tremendous success! It was everything I had envisioned with music, fun and frozen yogurt all night long! I’m proud of my family for working so hard on this project with me and I’m proud of this team for running away with the vision and pressing on to raise $1000’s of dollars for the Epilepsy Therapy Project. I’m thankful for the generosity of the Antos and sweetFrog Frozen Yogurt for supporting our cause. We have already raised over $8,000 and it’s only the beginning! We got some very exciting news just today that we will be sharing soon! We are SHAKEN things up, purple style… You just wait and see! 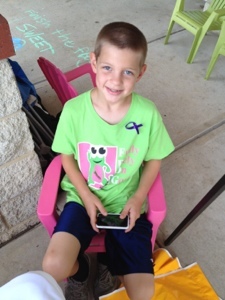 This entry was posted in Advocacy, Epilepsy Awareness and tagged Advocacy, Epilepsy Therapy Project, Philadelphia Half Marathon, Running, Shaken Not Stirred, SweetFrog.